As you know, the past several weeks I have participated in the 2017 New Quilt Blogger group hosted by Yvonne @ Quilting Jet Girl,Leanne @ She Can Quilt, and Beth @ Cooking Up Quilts. I want to thank these wonderful leaders one more time, especially Leanne who was my Let's Bee Quilt'n Hive leader. I learned so much through this experience. My featured blog can be seen here. The Blog Hop has ended, but I had so much fun meeting and following new bloggers that I decided to try Linky Parties. ​Linky Parties are where a blogger links their blog posts and/or quilt photos to another site so that others who have similar interests can easily see them. Typically Linky Parties open on a certain date and have a window of time in which you can link your post. Some of them allow link-ups by Instagram or other social media. I have heard that participating is a great way to meet quilters who have similar interests and to see quilts made by others with similar interests. If you want, you can view the link-ups without linking up your own post. Simply click on the link. In fact, Linky Parties encourage their participants to visit the linked-up sites and provide encouraging comments. Before participating in a Linky Party, I decided to do some research. I searched blogs that I follow for their favorite Linky Parties, and I searched for them on the internet as well. In particular, I found that Link Parties at Quiltalong.net is a useful resource. This site shows many opportunities and provides links to the parties. You can even submit your own Linky Party if it is not currently listed. After much investigation, I chose three Linky Parties that I want to try first. ​As discussed in a previous post, I am taking an online course that focusses on scrap quilts because I want to learn more about how to use my scraps to make attractive scrappy quilts. 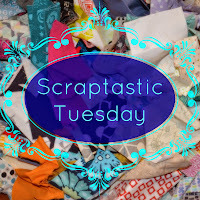 Therefore it seemed natural to link to Scraptastic Tuesday hosted by Leanne @ She Can Quilt and Nicky @ Mrs. Sew and Sow. This party is for works in progress or finished quilts that use up your scraps and for scrappy hints (For example: How do you store and sort your scraps?). 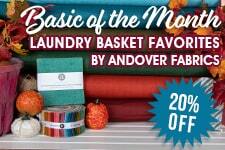 The link opens on the second Tuesday of the month and continues through the following Monday. An added benefit of this party is that everyone who links is eligible for giveaways! If you want to know more, click on the image. ​I like to do English Paper Piecing (EPP) and hand embroidery when I am traveling. Therefore, I found Slow Sunday Stitching of particular interest. This party is hosted by Kathy @ Kathy's Quilts. It is a weekly link-up that opens on Sundays. I am currently working on several EEP projects so I thought that this party would provide motivation to keep them moving. This link is fine with showing the progress you are making as well as finished projects. I found the link-ups to be inspirational as well. It is sometimes hard to find other stitchers who are interested in slow moving projects. If you want to know more, click on the image. I hope that you found this information helpful, and I hope to see your quilts and works in progress at a Linky Party site soon. Apirl, thanks for this post. I too love a linky party. I get to see other quilters that I may have never seen. Thanks for the quilt along link, I am going to head over to check it out.